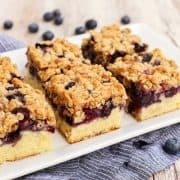 These Blueberry Oat Crumble Bars are filled with fresh, jammy summer berries and topped with a buttery, oats-crunchy topping. There are so many reasons to love summer, but one of the biggest highlights for me is the abundance of fresh, local fruits and vegetables. That produce may be coming from our own garden or a neighbor’s, or a local u-pick or farmers market. I’ve also been happy to find more and more locally grown foods showing up in the fresh produce section of our larger grocery store chains, where the stores are proud to call out “grown in Minnesota”. This makes me so happy! Another thing that makes me happy? These Blueberry Oat Crumble Bars. 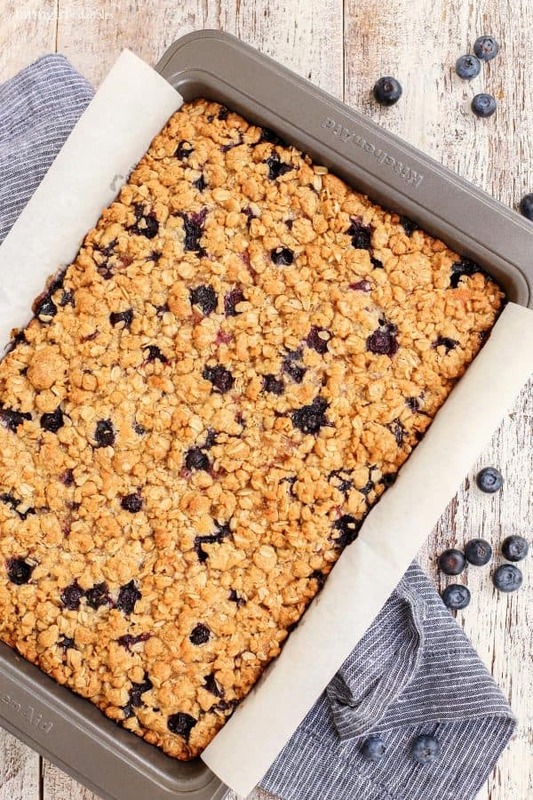 Give me fresh jammy summer berries and a buttery, oats-crunchy topping, and I’m all yours. This post is sponsored by Land O’Lakes, Inc. 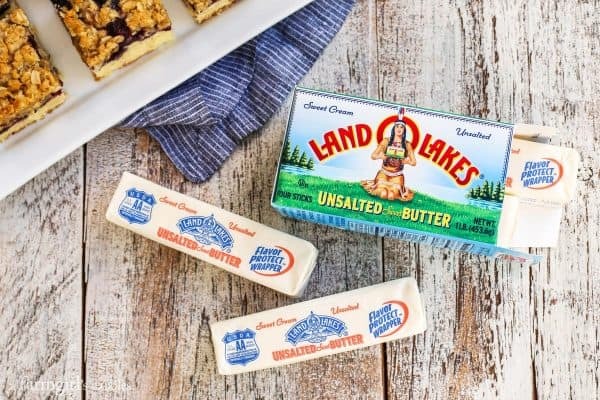 I am so very honored to be partnering with Land O’ Lakes again this year. Their headquarters are a short 20-minute drive from our home, which makes this an extra special partnership for me. This year promises plenty of new, buttery-delicious recipes and fun experiences. I’m excited to watch it all unfold and share everything with you! Land O’Lakes’ new tagline is “Add a Little Good™,” which inspired me to think about what I do to bring smiles to those around me. And for me, it’s about the little things. The gestures that feel natural and uncomplicated. Like picking fresh strawberries, raspberries, or tomatoes from our garden, and then knocking on a neighbor’s door to share a bowl of the goodness. Not only do our neighbors appreciate the fresh eats, but it gives us the chance to connect and catch up on what’s been going on in each other’s lives. I try to make a point to involve our young daughters in these little trips across the street, to teach the girls by example what it means to bring good to others. Sharing good with others is especially easy when it comes to baking. 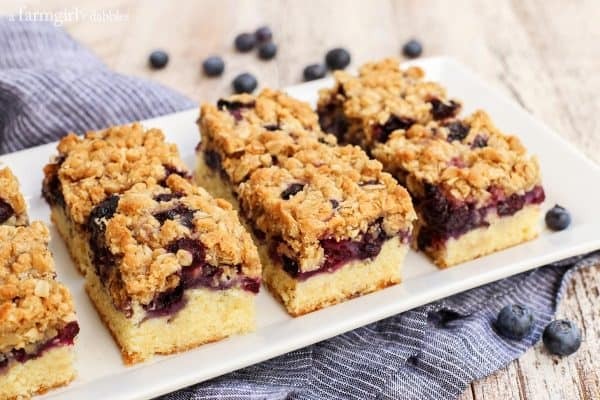 I can’t think of anyone who wouldn’t be grateful to receive a small plate of these blueberry oat crumble bars. 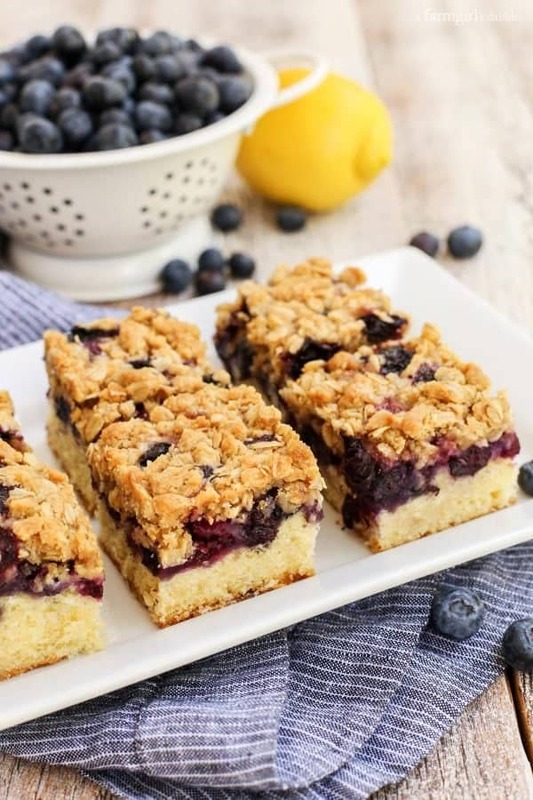 Made with sweet summer blueberries, these buttery squares are sure to bring forth smiles. 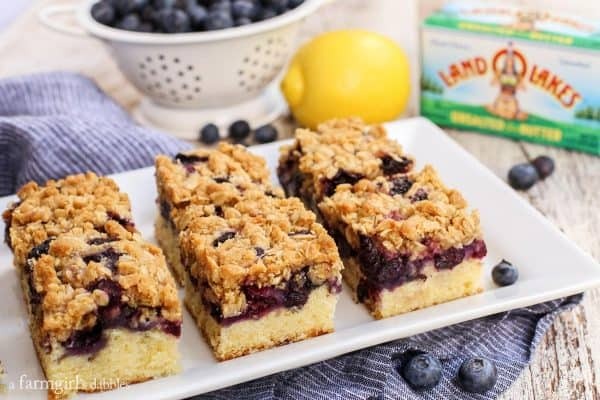 Land O Lakes® Butter is the essential ingredient in these blueberry oat crumble bars. But it’s also the all-purpose butter that’s great for every use, every day. My family uses it for cooking, baking, spreading, and topping. We are never without this sweet cream butter in our kitchen. At the base of these bars is a dense cake-y textured layer that is rich with the signature creaminess and flavor of Land O Lakes® Butter. On top of that are fresh blueberries that, when baked in the hot oven, emerge irresistibly jam-like. And crowning the bars is a crispity-crunchity layer of buttery oats crumble. Altogether, this adds up to one beautiful sweet treat, perfect for sharing good with others. Preheat oven to 350° F. Lightly spray a 9″ x 13″ pan and set aside. Or line pan with parchment paper, whichever you prefer. In a medium bowl, whisk flour, baking powder, and salt. In a large bowl, using an electric mixer, beat butter and powdered sugar until light and fluffy, about 1 to 2 minutes. Beat in the eggs, one at a time. With mixer on low, beat in vanilla, and then the flour mixture. Spread batter in prepared pan. In a medium bowl, stir together sugar, cornstarch, lemon juice, and lemon zest. Gently fold in blueberries. Spread blueberry mixture evenly over bottom cake layer. In a small bowl, stir together butter and brown sugar. In a separate medium bowl, whisk flour, oats, baking powder, salt, and cinnamon. Stir dry ingredients into the wet until incorporated. With your fingers, break up dough, crumbling it onto the top of the blueberry layer, leaving some larger chunks here and there. 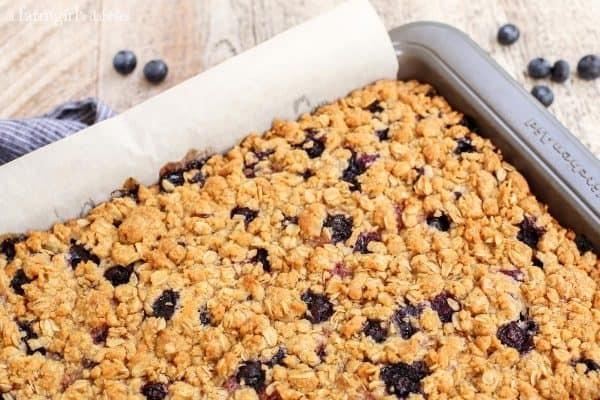 If you like to have some of the pretty blueberries peeking through on top of the cake, poke a few blueberries randomly up through the oat crumble layer. Bake until cake is set and the oat crumble layer is nicely golden, about 70 to 75 minutes. Let cool completely in pan and then cut into bars. Serve as is, or with some freshly whipped and sweetened cream.